Mathew Bate: Before we get into what you guys are doing now, I think it’s important to flag that BlockGrain is rooted in assisting farmers first and foremost, and that it existed before it started utilizing blockchain technology. Is that right? Correct me if I’m wrong here, but BlockGrain is more or less a second iteration of a platform that was created to boost supply-side efficiency for farmers dealing with commodities, like grain? Sam Webb: Absolutely, that's correct. Most businesses are usually intrinsically linked to blockchain or, like us, they pivoted into the space when they realised the value that blockchain can bring to a technology like the one we’re developing. Let’s get to blockchain, but I want to start at the root issue that you guys are trying to solve. What are the historical problems with the agricultural supply chain and how does BlockGrain help overcome them? So basically at every point of the supply chain, as it stands now, there are problems that could be addressed or need to be addressed. Farmers have issues with the visibility of their stock and understanding how much and what types of stock they have at any one point in time. Grain is not always stored in one particular location and can even be spread over multiple locations, not to mention it’s always being bought, harvested and so on. We've had feedback from farmers that if the price of grain rises, and a very lucrative contract comes through, they don’t know whether they actually have the stock to be able to service the contract and so they often have to walk away from it. Many farmers realise after they’ve said no to a contract that actually they could have serviced it, thereby losing out in the tune of thousands of dollars worth of revenue, because the stock price has then probably fallen back down. Logistics companies also struggle with the fact that they have to deal with a lot of manual paperwork. They get in-load and out-load dockets, for example, from bulk handlers that can sit in their truck for a long period of time, which they then have to fax back to their office where an invoice can be raised weeks later. We were even talking to a broker a little while ago and he had a 1,200 tonne grain contract. 1,200 tonnes of grain left the farm and about 1000 tonnes of grain arrived at the bulk handler; 200 tonnes of grain just went missing. No one knows where it went. Did it blow out the back of the truck? Did it go to the wrong place? Nobody knows. So, you know, visibility around truck movements can be problematic and untraceable. I read in your white paper that it is estimated that, globally, around 30% of stock goes missing, from the farmer to the end consumer. I mean, it’s one thing that 200 tonnes of grain literally seems to disappear and the supply chain isn’t able to track it down, but we’re also dealing with huge waste problems as well aren’t we? That’s true, it's also waste, and that often comes from improper storage and handling of stock and it comes from a degradation of the product through various means. Moisture gets into wherever it might be stored as well as pests. That statistic you mentioned is actually taken from a UN report. It’s also important to note that different economies have issues at different points of the supply chain. So in developing economies the inefficiencies are usually earlier in the supply chain, where it really does come down to things like storage and handling. In developed economies the bulk of the problems appear later in the supply chain. The typical example that we see in Australia is when supermarkets throw away perfectly good food. That’s still waste in our supply chain that’s not being consumed by an end user. So I suppose those are the differences between the two economy types. Commodity brokers at the minute don’t have a system to be able to get visibility over all their growers so they know what they’re doing and what their stock levels are. Their business usually involves a considerable amount of phone calls and paperwork. There’s some basic systems out there at the minute but nothing that really gives them total visibility end-to-end, whereas with our system the broker can link to all of the growers they work with. A smaller broker might work with, say, 10 growers but larger brokers can work with in excess of 200 growers. Trying to coordinate 200 growers with seperate stock levels, stock types and so on is obviously quite difficult. 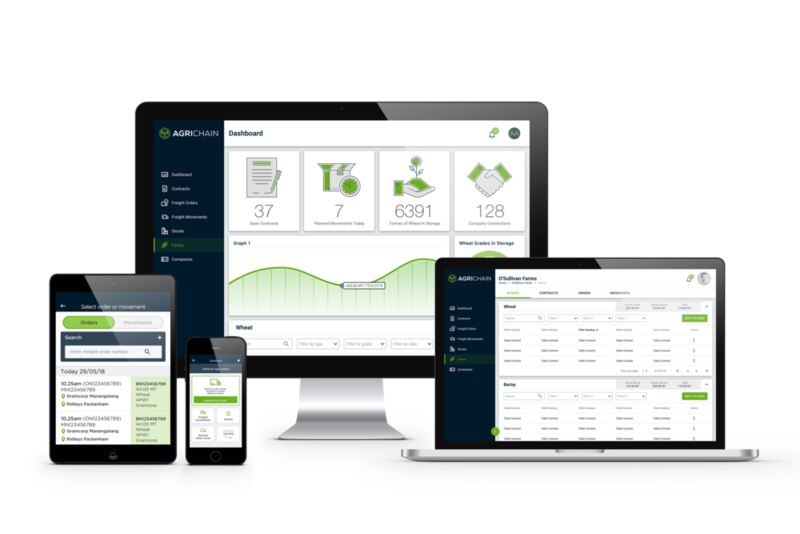 Using our system, brokers can get total visibility over all 200 growers, they can know what they’re doing, what they’ve got on their farm and what they’ve got in storage. Home storage is also an industry trend that's really been growing in grain for a while now. System storage is more of a traditional storage type where you might obtain space from a bulk handler and then store your grain in one of their facilities. Home storage, as its name suggests, is where the farmer decides to store grain on their farm either in silos or silo bags. This is becoming extremely popular. There is a growing number of farmers wanting to store grain on their farm and there's no system out there, besides ours, at the moment that really deals with home stored grain and the visibility and tracking of that. So BlockGrain is very much empowering the farmer. Absolutely and that is the mantra of our business; delivering value back to farmers. To give you an example of how we do that, there are certain companies that sell premium suits, that source wool from one particular farm in Tasmania and put a premium price tag on their suits because it's a single origin product of high quality. The same can be true for basically anything you wear and anything you put in your mouth. People are interested in knowing what it is and where it came from. With better stock management, using our app, farmers are able to have more control. It gives them a way to move away from a bulk commodity approach, where grain is collected from different farms and stored together. You lose visibility of your grain and there's blending. Most farmers want to be able to grow a good product and to differentiate it, not blend it. I want to build my own brand, as a farmer, because I do things the right way, because I grow great products and because I use the right processes to grow it. I can obtain a price premium from the market because people will want to pay for a product they know and they can trust. If I’ve got visibility over my product I can show people how it was grown and so on, and then I can capitalise on that. So how has blockchain technology helped enhance your business model? In a whole bunch of ways. 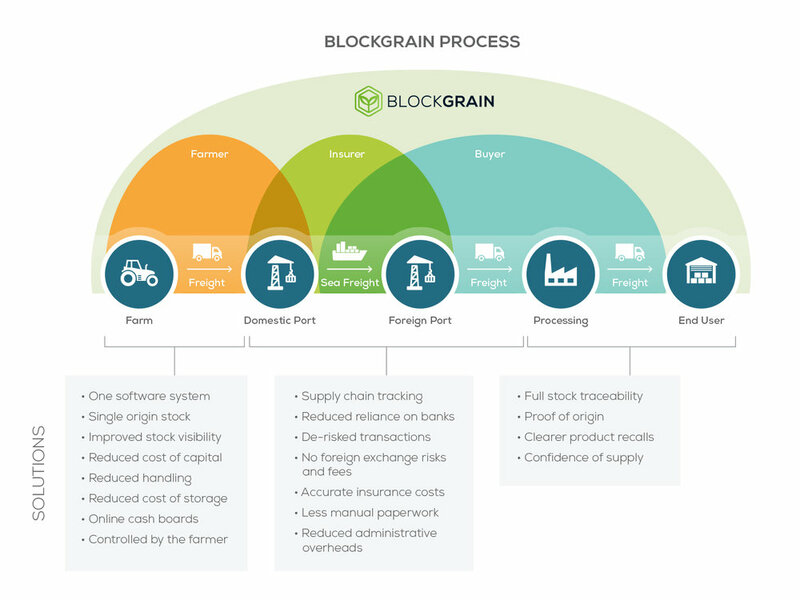 Agriculture and the supply chain are excellent use case examples for blockchain technology. There's a whole range of benefits that it provides but there are two overarching ones in particular. One is based around the proof of provenance. When you’re dealing with supply chain tracking and proving the origin of the product, blockchain creates an immutable record of exactly what has happened through a series of transactions. Ultimately, a supply chain is a series of transactions for a product to move from from a starting point to an end point. Being able to use a blockchain to create an immutable record of exactly what's happened is a very very powerful thing. I mean, people can claim that they know where a product has been but if you actually have to go back and prove it, in many cases that could be quite a difficult thing to do. As I say, blockchain certainly opens up that door and allows people to create a record, to the point where an end consumer can scan a product and it will show you exactly where the product has come from and how it’s traveled to be in your hand. The second thing that blockchain allows us to do is smart contracting. Smart contracting is a very, very important thing. It’s basically where two parties enter into an agreement. Once a series of criteria is met, funds are automatically transferred from the buyer to the seller. People know that they're going to get paid and that's really important because, at the moment, unless farmers in Australia go through a large freighting company or bulk handler, facilitating an international transaction is hard and highly risky. Bulk commodities are obviously large and difficult to move. If they're on a ship halfway to an end destination and a commodity price changes, that buyer, often, will try to back out of the deal because now it's not advantageous to them. The farmer is then caught short because they have commodity already halfway across the world, on a boat, headed to the buyer. So, with a smart contract it helps reduce that risk around international commodity transactions and it also gives more options for farmers because they don't have to use so many of those intermediaries when they’re trying to facilitate those types of transactions. You go from having to have letters of credit, relying on bulk handlers, and all of those sorts of things, to all of a sudden being able to strip out a lot of those layers. BlockGrain is accessible through multiple devices and the interface is intuitive and extremely user friendly. 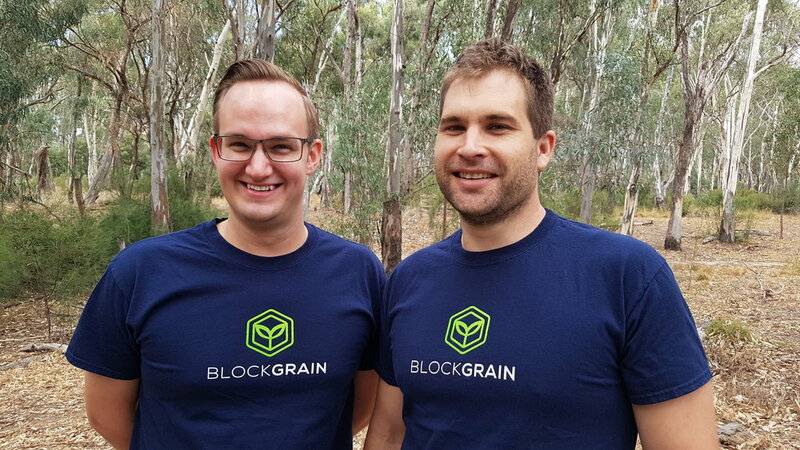 BlockGrain's COO Sam Webb (left) with CEO Caile Ditterich (right). "Absolutely and that is the mantra of our business; delivering value back to farmers." Let's move in to the actual interface. There seems to be an overarching, and definitely misconceived, idea that farmers aren't tech savvy. So, how does the front end interface work and is it easy to use? It's an app, so do you have it on your phone or your ipad? I think farmers are becoming more and more engaged with technology and there's a really excited and engaged generation of younger farmers coming through as well which I think is certainly bucking some of the more traditional views of farmers. But you raise a very fair point. Our product has basically two interfaces. One is a web interface which is really our administrative interface. So that would be for brokers, farm administrators and managers and then logistics managers too. Then we've got our mobile app which we call our operational interface and that's for when you're out doing things. So let’s say you're a farmer standing by your storage, your a logistics operator or a driver out on site or in a truck. This is really the interface that would probably give you the most benefit. For all of our interfaces, we try to make them as easy and simple to use and we really think about the user experience. For administration, obviously people in that role use computers as part of their role already, so they're probably a bit more bit more engaged with the technology for the operational interface. We've really had to think about how we are making that as easy to use as possible. We're looking at oversized buttons, lots of imagery and iconography. It's logical, it's simple and we minimize scrolling in our app as much as possible so you move from screen to screen without having to scroll. We've also tried to build in a lot of flexibility and a lot of intuitiveness as well into our app. We use GPS tracking and when you set up a farm in our system you put in the farm’s address but you also put in every single field’s latitude and longitude coordinates as well. If you have GPS connectivity the app can work out where you are and you can track with precision. We also are working with Optical Character Recognition (OCR) technology. When you're delivering or picking up grain from a bulk handler they give you a docket. You can take a photo of that docket and the system scrapes the data and plugs it in for us automatically. So if that docket gets lost they still have a record of it. Dockets get lost all of the time. We also just try to build as much intuitiveness into the app as possible. Our mobile network is offline too, which is something really important because obviously mobile phone coverage is sketchy so it's able to work in an offline mode and people are still able to us it. When they return to a service area and get network coverage everything is then uploaded to the app. So you're starting with grain but the idea is to move into other commodities? Ultimately any agricultural product that has a supply chain, which is all of them, can use this, yes. We're starting with the grain industry but we’re researching the fruit and vegetable industries. We're also really excited about the wool industry and there’s lots of opportunities in livestock. So, yes, obviously we're starting in grain but we're certainly looking at expanding into other industries as well. You started with grain because that was where you had the most knowledge? Yeah well there's probably a few reasons why we started with grain. The first one is because our CEO's knowledge and background is in the grain industry and we have a lot of contacts and networks within the industry. We understand the problems of the industry very intimately. The other thing as well is in terms of the supply chain. The supply side for grain is actually quite complicated. So if we can get grain right, there's some agricultural industries out there that would be much more straightforward and it will be easier to shift into those areas. Is this solely for Australian growers? No, we can expand. We're starting in Australia because we're an Australian business, you know, with Australian staff and we know the Australian industry well. We're certainly looking at opportunities to expand our products and it's certainly something that we can take globally. Obviously there'd be modifications required for the different industries that were going to or different geographical locations but this is something that could certainly be applied anywhere. You've covered a lot here in a short amount of time. For me, the major takeaway and the biggest positive is that you guys started with the farmers and their problems first and foremost. You developed the technology to assist you. Often people are just trying to develop an app and are looking to apply it to something. You guys have your priorities in order. Yeah we find that really important because the value of our business goes beyond blockchain. Blockchain plays a key role and certainly unlocks a lot of valuable features for us but what we offer goes goes beyond the technology. We existed before the blockchain craze. We’ve found a way to get a lot of value out of blockchain technology and I think that it's something that can be very powerful going into the future. It's going to be prolific across most industries. But we’re a value driven business at our core and that goes beyond the technology. I think that's really important to understand. At the moment though we are incredibly busy. We're in conversations with people about blockchain trials and how this might be able to benefit their industry. We're launching our full release product in August and then we'll be rolling that new product’s suite out across our customer base. People are calling us every day asking when it’s going to be ready. Everyone’s really excited. There are so many opportunities out there to apply our model to. There's a lot of potential for this product and this technology and we're really excited about the value it can deliver to farmers. Mathew Bate is the digital editor of Matters Journal. He's a published poet from Melbourne that likes to walk. "As I say, blockchain certainly opens up that door and allows people to create a record, to the point where an end consumer can scan a product and it will show you exactly where the product has come from and how it’s traveled to be in your hand."